Typically budget AR15’s aren’t always the “deal” they appear to be. Typical sub-par rear sights, generic mags and economy barrels. That is not the case with Aero Precision’s low cost entry the Aero AC-15. The rifle features a Magpul MBus rear sight, Magpul 20 round PMAG and Aero’s own 16″ 1:7 Chrome Moly barrel. In my opinion this is a great entry level rifle and a solid foundation to build from. 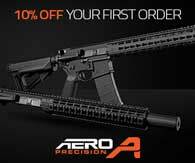 Visit Aero Precision for current pricing. The Aero Precision AERO AC-15 Complete Rifle is a budget friendly, high quality rifle featuring mil-spec parts and accessories made in America.This cost-efficient rifle is ready to operate straight out of the box and can easily be upgraded over time. Don’t sacrifice quality to save money – buy from Aero Precision and have confidence in your rifle. All Aero Precision complete rifles are assembled by our professional gunsmiths and are tested prior to leaving our facility.